NordicTrack Freestride Trainer FS9i – Read our full review here. The award-winning NordicTrack Elliptical Trainers are conveniently for sale online and include Free Shipping. You can shop their user-friendly web site and select the model right for you. However, they have a variety of models and designs that can make the buying process confusing. Our experts are here to assist our Canadian friends in buying the right model for your body and budget. Elliptical trainers typically come in front or rear models. But NordicTrack also has a center drive design. In addition, they offer the innovative FreeStride Trainers. Below is a description of each design. The FreeStride Trainer basically liberates your motion. Rather than having to follow a defined path like all elliptical trainers, you have the ability to define both the path and the length of the path. For example, you can have short strides or very long strides, and you define your own vertical motion. What are the benefits? You can target more muscle groups and potentially get more definition to your body. 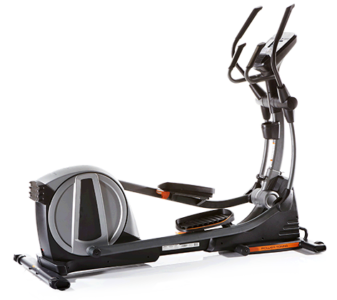 Due to this unique design, the FreeStride Trainer can simulate an elliptical trainer, treadmill or stepper. Since coming on the market several years ago these machines have become some of the top sellers. These are great machines for staying in shape during those cold Canada winters. Space Saver SE7i – Read our full review here. The first elliptical trainers on the market were rear drive and one of the advantages is they offer a very ergonomic workout that minimizes stress and strain to your joints. Their two models, the NordicTrack SpaceSaver SE7i and SpaceSaver SE9i, are designed after high end commercial elliptical trainers. Their elliptical motion is smooth and natural. The machines are very stable and they are very simple to assemble right out of the box. The only concern is the 18” stride length, which may be too short for some, but should accommodate the majority of users. As of the writing of this review, NordicTrack had four rear drive models ranging from $800 – $1,500. These are solid and durable machines that offer the benefit of easy mounting. Each model offers a heavy flywheel that gives a very natural motion, sort of like running in the air. They also all have a slightly longer 20” stride to accommodate taller users. In numbers, the front drive machines are actually more popular than the rear drive machines due to the selection and various features. They are also very simple to set-up out of the box. 10″ Web Enabled Touchscreen available on the NordicTrack ACT Commercial 10 – Read our full review here. 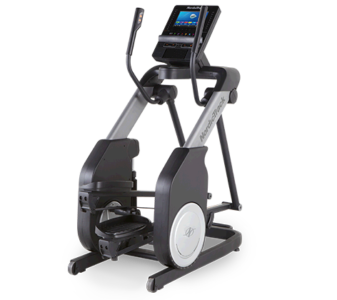 NordicTrack A.C.T Commercial ellipticals have been offering this unique center drive design for a number of years. We do feel that the front and rear drive machines have a more natural elliptical stride. 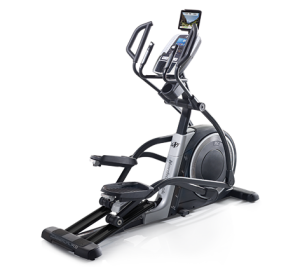 Still, the one advantage of the center drive ellipticals is that they have variable stride lengths from 18” – 22”. Plus, the A.C.T. Commercial ellipticals can accommodate several users of different heights. In addition, the center design makes them extremely stable and easy to mount. There are two note worthy features found on only NordicTrack Elliptical Trainers and FreeStride Trainers. Full color touch screen displays on available on a number of their machines. On some models when you subscribe to iFit Coach you can actually access the Internet on the elliptical as you workout. 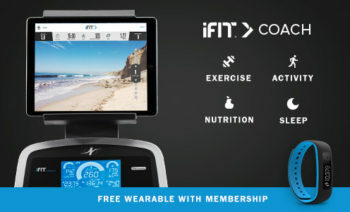 iFit Coach & iFit Coach Plus is a motivation and inspiration technology that is designed to assist you in reaching your fitness goals. There are too many features to mention here, but here is a short run down. Get daily livecast fitness classes. Follow your favorite professional trainers as they lead you through intense cross-training exercises. NordicTrack Elliptical Trainer Canada Sales – How to Buy! FreeStride Trainer FS7i – Read our full review here. It really is quite simple. 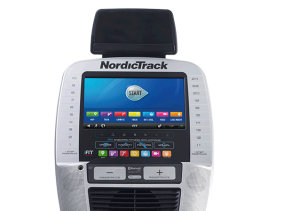 After you have checked out our reviews, you will find convenient links to the Canadian version of the NordicTrack. From there, you can go to the product page and shop online. Note that NordicTrack offers Free Shipping on all their models, but that can be often to the curb. Sometimes they may drop it off in the driveway. You may want to consider upgrading to indoor delivery because the machines are very heavy. 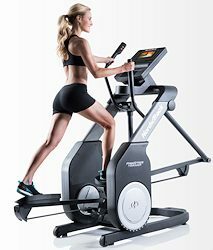 Regardless you which elliptical trainer model or design you buy, know that NordicTrack is the leading fitness equipment manufacturer in the world, in addition to being the most innovative. If you are considering an elliptical trainer, NordicTrack should be a consideration. And with their strong presence in Canada you’ll access to their Canadian sales and service network.